Rolf F. Warming. Photo taken by Jacob Nyborg Andreassen, Combat Archaeology. Rolf Fabricius Warming is Danish archaeologist, whose studies have preeminently been on the subject of combat and conflict in the past, ranging from Mesolithic violence to organized state formation in the early modern period. 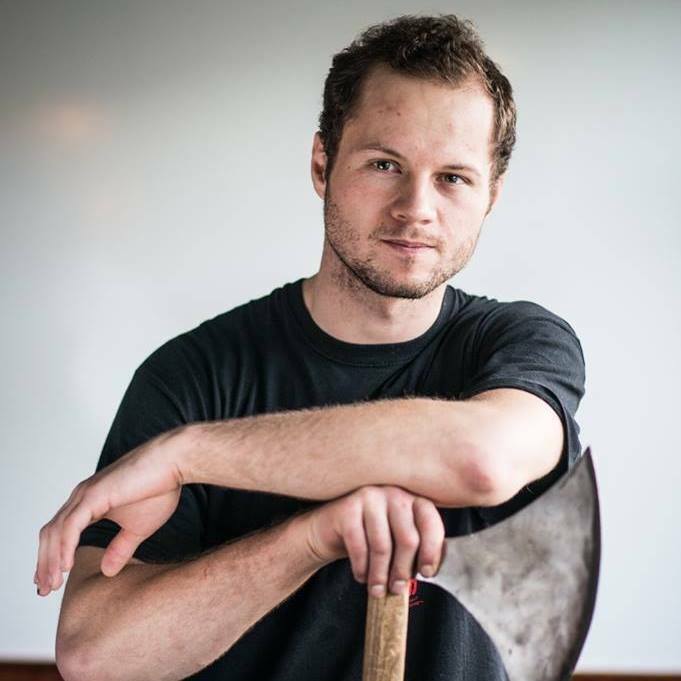 He holds an MA degree in Maritime Archaeology and is currently finalizing his dissertation project for another MA degree (in prehistoric archaeology), which is focused on Viking Age shields and martial practices. He has the rank of sergeant in the Royal Danish Army and is a master and the chief instructor of a martial arts system, teaching classes and seminars on a national and international level. He is the founder of Combat Archaeology, an organization committed to researching and interpreting material and issues on the subject of combat in the past. 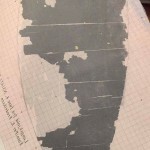 How many shield fragments have we found in Viking Age Denmark? 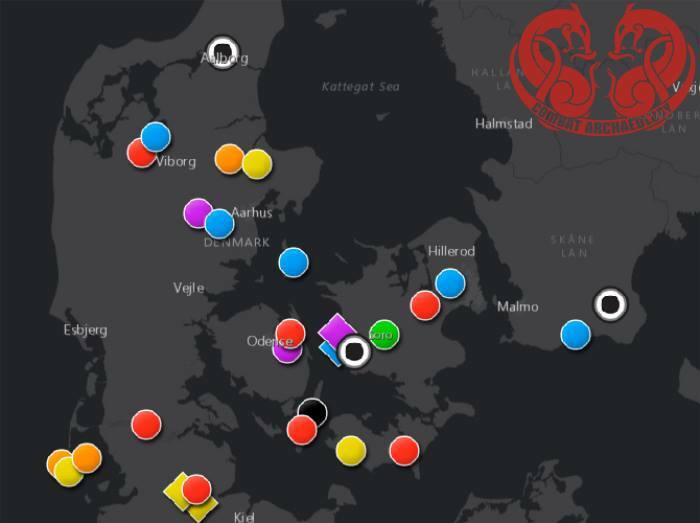 At the time of writing, we have exactly 40 positively identified shield remains from Viking Age Denmark (including Schleswig and Scania). There are an additional 3 miscellaneous or missing artefacts which may represent other shield finds but too many uncertainties exist as to the nature of these finds at this point. An overview of shield fragments from Viking Age Denmark. What does the average shield look like? “Nu scolo menn vapn sin syna sem mælt er i logum. scal maðr hava breiðöxe. A scheme of the shield construction. Made by Sergei Kainov and Oleg Fedorov. It is difficult to offer a simple description of what the average shield would look like. The shield remains signal quite individualized designs, both in terms of constructional elements and dimensions, at least as far as shield bosses are concerned. 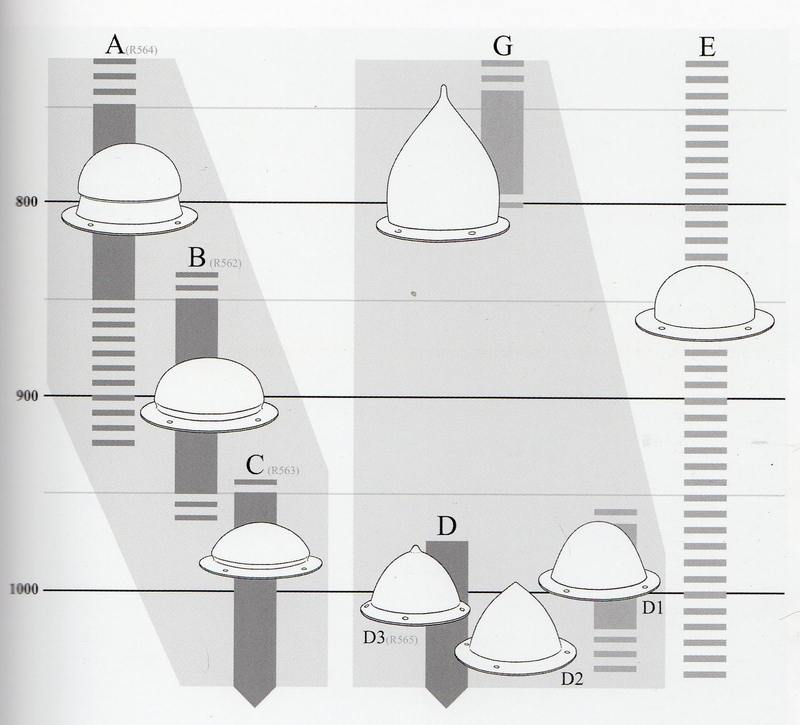 Some shields were fitted out with more reinforcing or decorative fittings while other shields differed in terms of shield boss morphology and dimensions. 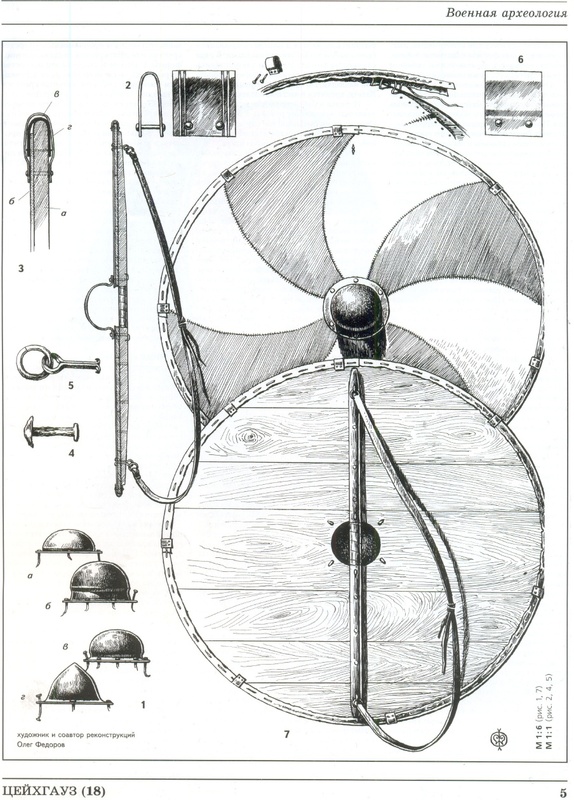 Several shield types also appear to have been in use during the Viking Age. The flat round shield is the most well-known of these, but convex round shields also appear to have been used. It is possible, too, that some forms of kite shields could have been employed as early as the 10th century, although these shields are conventionally understood to appear around the time of the Bayeux Tapestry (c.1070) which contains the earliest depictions of such shields. However, at the risk of losing scientific rigor, the following observations may be given to offer a basic description of features that may be said to characterize the majority of the common flat round shields. The vast majority of Viking Age shield finds are sparse in metal. Often the shields are only recognized by the surviving fragments of the shield boss, the metal centerpiece of the shield, which frequently constitutes the only metallic part of the shield. 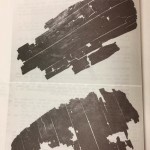 However, it is possible that shields constructed of purely organic material may have existed as well, judging from the nearly intact shield from Tira, Latvia, which is dated to the 9th century and was equipped with a wooden shield boss. The iron shield boss of Viking Age round shields was usually fastened to the board with 4-8 iron rivets over a somewhat circular hole. 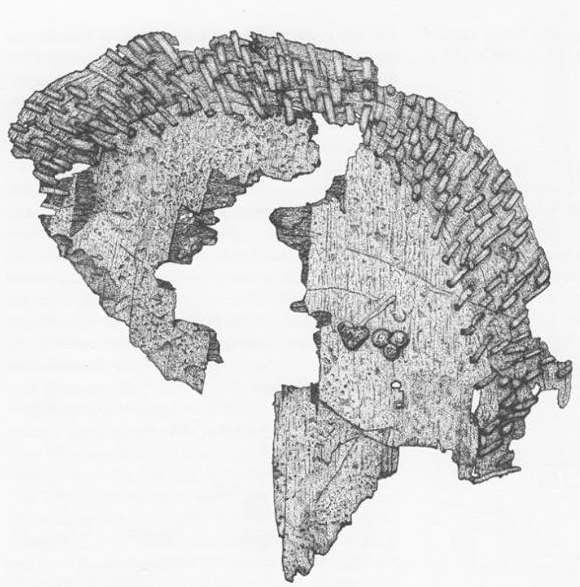 The shield board itself consisted of c. 6-8 softwood planks which had a thickness of no more than 1 cm in the center and tapered gently towards the edges of the shield. In cases which have allowed for an estimation of shield board diameters, the measurements have yielded a range between c. 75 and 90 cm. 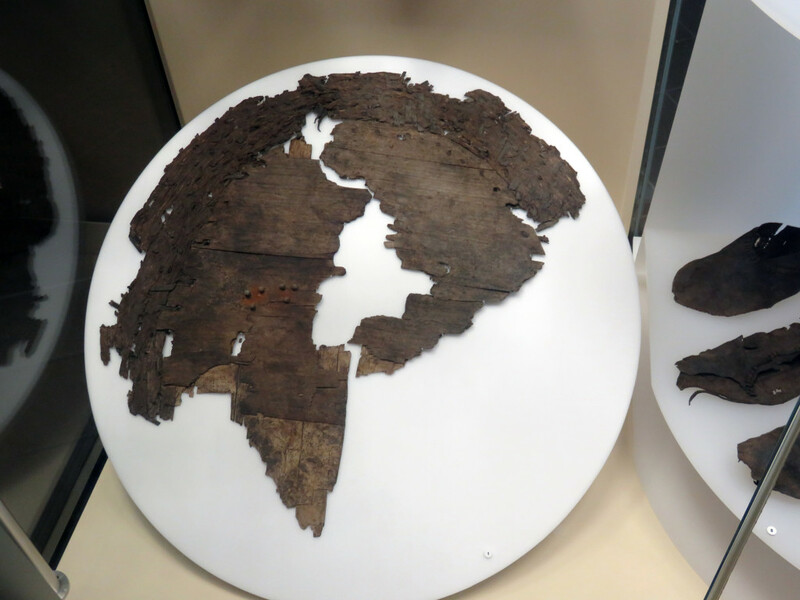 Typically, the wooden handle, which could consist of hardwood or some more rigid timber compared to the planks, appears to have spanned across the shield board and riveted onto here in multiple places. For the sake of economy and ensuring a lightweight construction, it was desirable to let two of the rivets from the shield boss flange pass through the handle. 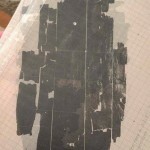 The shields were most likely equipped with a thin leather facing which was applied to the front of the shield board; assumedly, a similar leather facing could also be applied to the back of the shield. 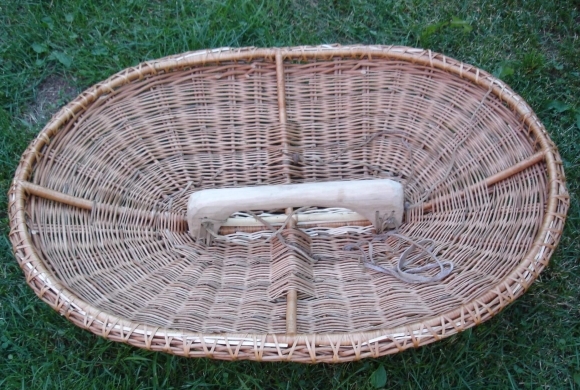 A rawhide edge could be stitched to the shield rim with a thread of some organic material, perhaps sinew or leather. Later round shields of the Medieval period appear to have been of a more robust construction and included, among other things, more reinforcements of iron, if we are to judge from the historical sources. 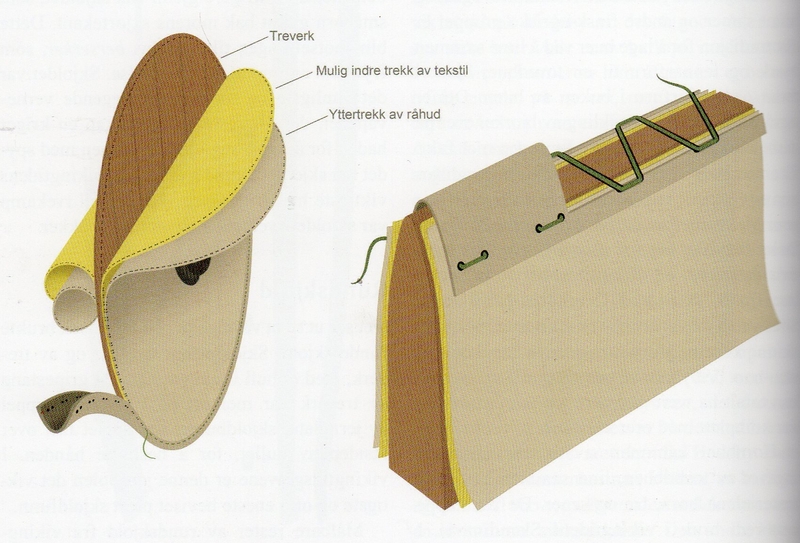 A version of the shield construction suggested by Kim Hjardar and Vegard Vike. What about more expensive shields? Typology and chronology of some types of Scandinavian shield bosses. Made by Kim Hjardar and Vegard Vike. 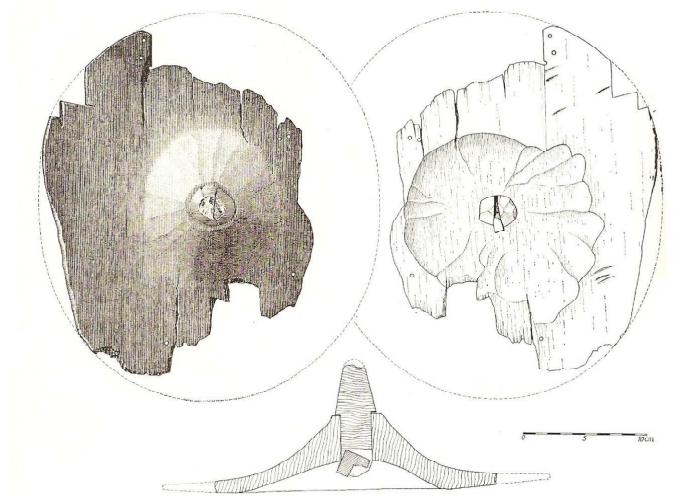 In the case of more expensive round shields, the fastening of the rawhide edge could be further enforced by use of a few bronze or iron clamps. In a few exceptional finds from Valsgärde and Birka in Sweden, however, the clamps cover larger parts of the shield rim, even its full circumference, in which case it is more likely that they have served to reinforce the rim as a whole. Other more elaborate shields are fitted out with trefoil-shaped handle terminals of copper-alloy which have been decorated with human masks and animal heads. These appear to have fastened the handle more firmly to the shield board. The back of the long handle and grip could be reinforced with copper-alloy or iron fittings which are sometimes seen decorated with silver plating, ribbon lacing or braiding patterns and human masks. Occasionally, the entire grip or handle appears to have been constructed out of metal. In only exceptional cases is the flange of the shield boss given a more elaborate shape – such as a toothed flange, or the shield boss adorned with non-ferrous metal – such as thin bronze strips – which could be fastened around it’s flange or the wall. So, although some of these fittings are of a more elaborate kind, there is no evidence for superfluous or purely decorative fittings, which, by contrast, are known from the war booty sacrifices of preceding periods. The fittings, or that to which they are attached, all have a function and are largely for the purpose of providing additional strength. However, when using such elaborate fittings, the Viking Age Scandinavians do not appear to have shunned away from the opportunity to display excessive decorative elements. The human mask, animal heads as well as the ribbon lacing and braiding patterns appear to have been recurring themes. Both historical sources and microscopic traces of color also indicate that the shield boards themselves could be decorated, although this is, strictly speaking, not limited to expensive shields. Weaponry has throughout history been given as gifts. And judging from both the archaeological record and historical sources, there is no doubt that also shields could be perceived as highly valued objects. The shields could be painted and further accentuated by beautiful decorations. Associating a high quality shield with mythology or ancestral achievements would of course render the shield an object of much admiration and a fitting gift. Designs of shields based on pictorial evidence. 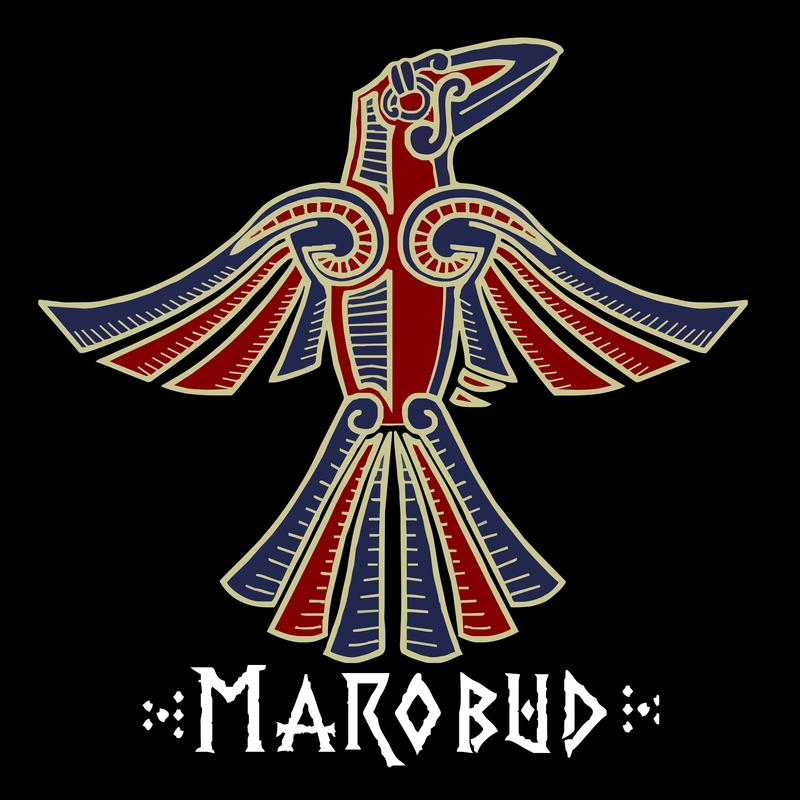 Made by Marobud. How could shields be used? Given the development and coexistence of different shield types and shield boss types as well as regional discrepancies in offensive weaponry preferences, it is clear that no single answer can be given as to how the shields were used. It is, in fact, even difficult to speak of a so-called “Viking fighting style”, as such! Instead, the material suggests that combative styles varied in the course of the Viking Age and across the various Scandinavian regions, expressing also influences from other cultures, such as the Carolingians. What also complicates matters is that the functional aspects of shields can be examined on many levels, including the operational, tactical and strategic levels of warfare. Nonetheless, it is evident that any inferences made into any functional aspects of shields must be grounded in knowledge about how the shield was used on an individual level. 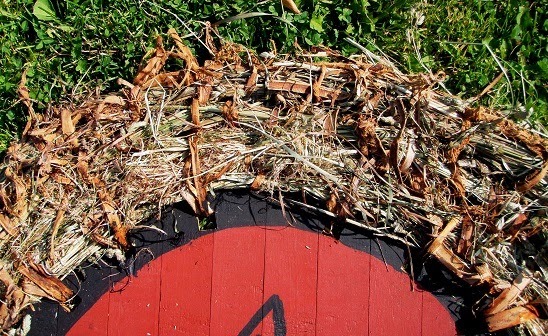 Let us focus on the common flat round shield, which is commonly thought to characterize Viking Age combat, and how it was employed in the context of close quarter combat. Like the military combative systems and martial arts of the modern world, there probably existed various approaches to combat and even nuances of what some considered the same combative styles. Nonetheless, the construction of the flat round shields allows us to examine some of the main underlying principles that may have governed most combative uses of this shield. The flat round shield was a thin, lightweight shield which was held by the center grip, without any enarmes (i.e. straps that could fasten the shield more firmly to the forearm). This, along with the center hole (protected by the shield boss), which allowed the hand to grip the shield closer to its center of mass, and the circular shape of the shield greatly facilitated maneuverability. The fragility of the shield necessitated precisely such maneuverability since the shield-bearer would have to make use of the concept of deflection if he did not want the shield to break easily. Rather than a mere passive defense, the shield was used actively. This could be done with the shield held flat in front of one´s body or at an oblique angle with the rim facing roughly forwards. In both cases, however, practical experimentation with a sharp sword and round shield reconstruction indicates that there is a strong correlation between the degree of deflection and the extent to which the shield is actively thrusted forward. If this use of the shield did not contribute to the notorious aggressive behavior of the Vikings, it is at least very much in line with the bequeathed image of these light and aggressive infantrymen that assumedly reflect the nature of Scandinavian combatants throughout most of the Viking Age. Actively used shield. Reenactor Roman Král. In short, what we have is a very actively used shield. In defensive situations the shield could be thrusted forward or maneuvered in a manner that would better deflect incoming attacks; in offensive situations, where the shield-bearer himself would attack, the shield could act as an offensive striking weapon that could be used to create openings for one’s axe or sword, particularly through powerful strikes with the shield rim. Assuming that round shield construction did not deviate to any extreme extent, the shields were employed by using these principles in both the context of single combat and in formation fighting; there is, to my knowledge, no supportive evidence of static shield use, even when speaking of such concepts as “shield-walls”. 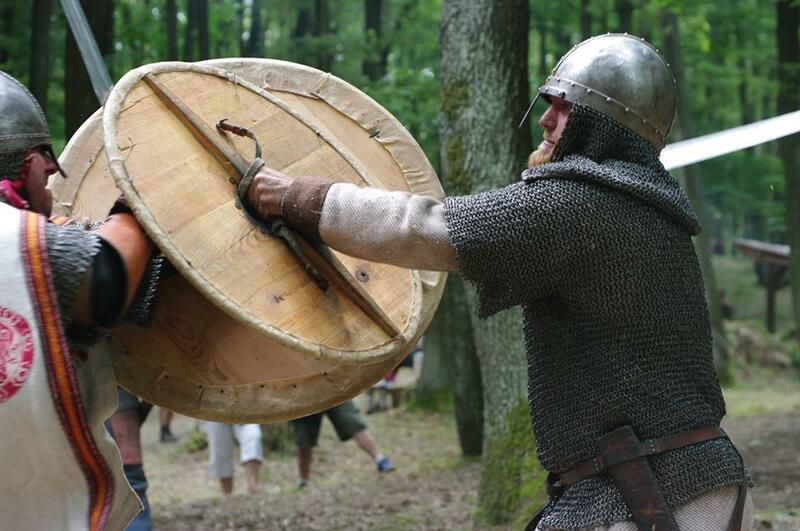 The case is different in the medieval period where more robust shields are used. Interestingly, there is also some evidence suggesting that this tradition of actively used shields continues beyond the Viking Age, now merging with some branches of the medieval sword and buckler tradition. With all my respect and admiration, I would like to thank to Rolf Warming and his unique project Combat Archaeology for the interview. I hope you liked this article. In case of any question or remark, please contact me or leave a comment below. If you want to learn more and support my work, please, fund my project on Patreon.